I’m pretty sure that I did not buy one pack of 1993 Triple Play back in the 90’s, or ever best I can remember. 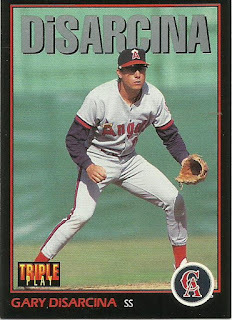 In ‘93 I was more focused on Upper Deck, my sights set on building the massive set (which is just about all gone now except for the Angels and a handful of stragglers). 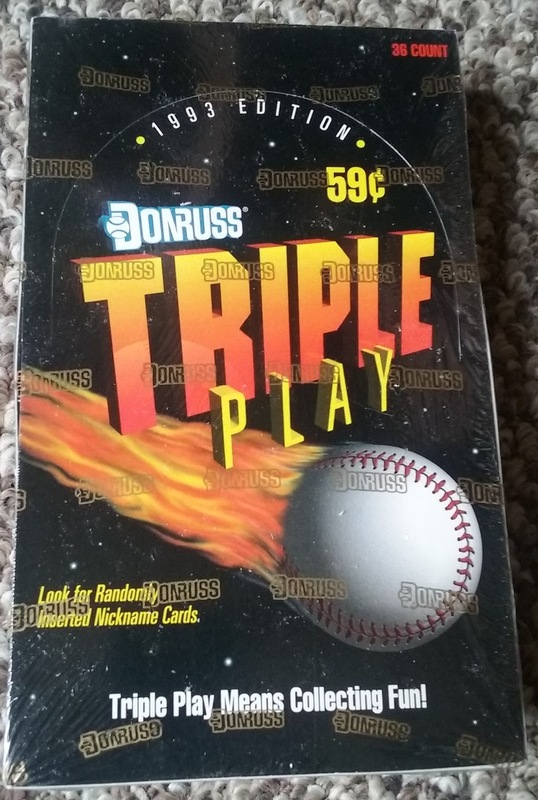 Also, at the time, I didn’t like the black framing of the Triple Play design. I was heavy in collecting autographs then and the dark design did not lend itself well to autographs, I was afraid the black would swallow up the signatures. Fast forward to now, and I love this design. 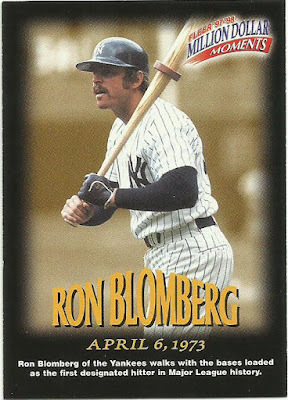 I love the black with the silver block font player names at the top. 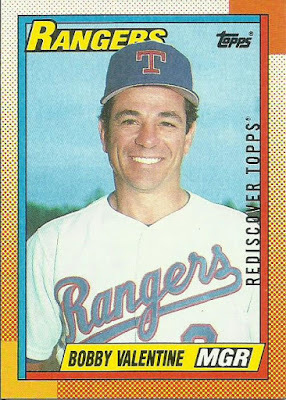 Part of that is because I don’t do autographs much anymore, and those autographs I do pursue revolve around several autograph sets I’m working: 1983 Topps, 1991 Upper Deck, 1991 Line Drive AA/AAA, 1992 Stadium Club, 2005 Fleer Tradition. Funny how interests change. The backs of the cards are simple with a player portrait, basic statistics, and a quote or a trivia question associated with the player pictured. 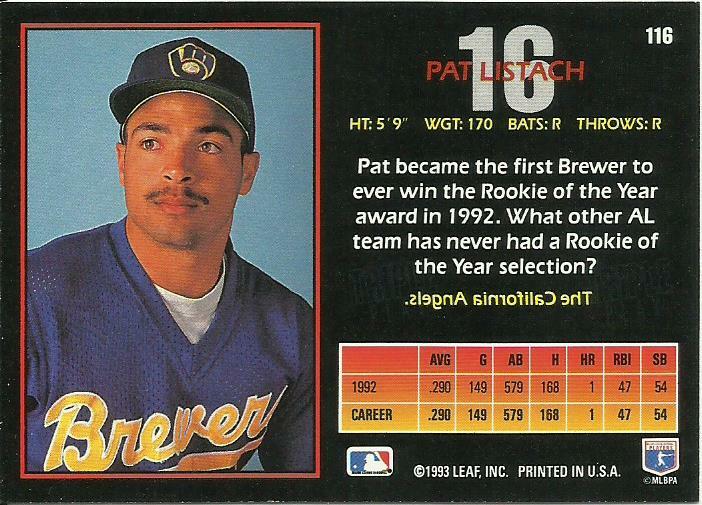 I like the trivia question on Pat Listach's card, because the following season negated the answer in that Tim Salmon became the first Angel to win the AL Rookie of the Year award. 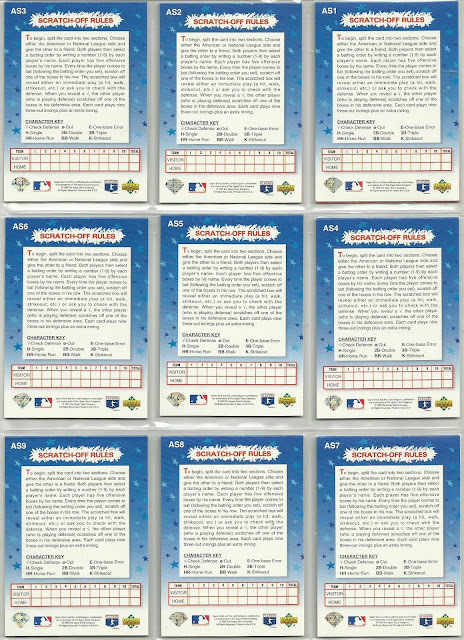 Another reason I like the set, and why I wanted to bust a box of it, was to pull as many of the scratch-off inserts as possible, a sub-set I was working on prior to taking more interest in the design. At one-per-pack, and 30 in the set, I figured I had a good chance to get most of the scratch-off set. But this is 90’s product and we all know that 90’s era collation was horrendous. 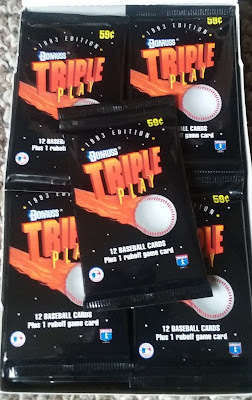 So, I busted a cheapo box of 1993 Triple Play, and I do mean cheap, like $2.49 cheap, plus reasonable shipping. 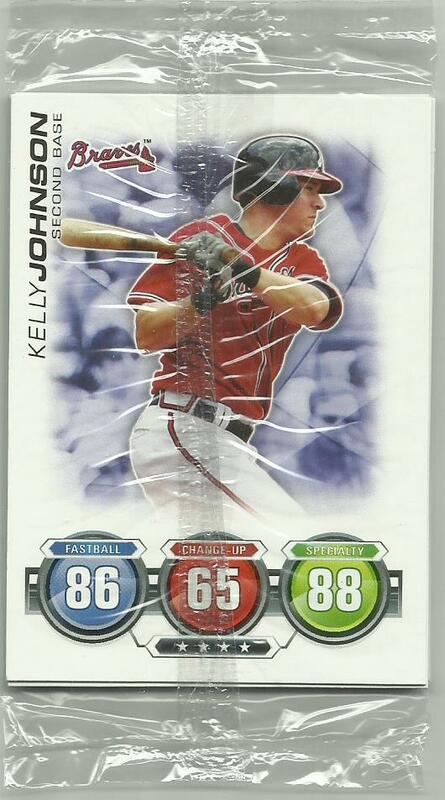 At 36 packs and 12 cards per pack I should get most of the set out of this one box. 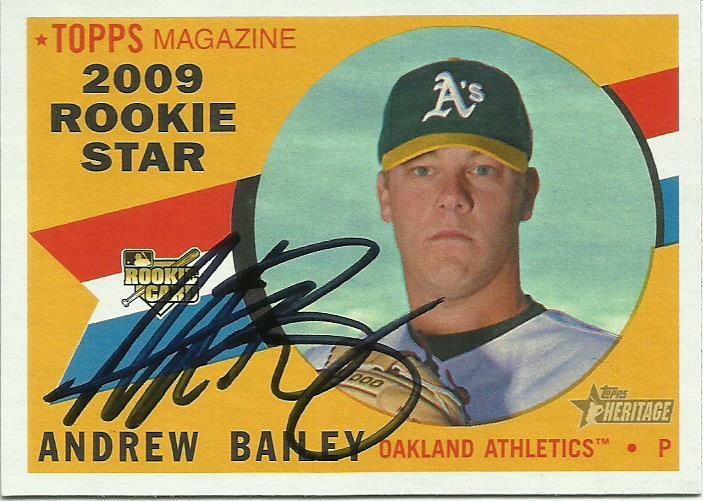 Okay maybe not a typical pack since there were so many superstars in that one. 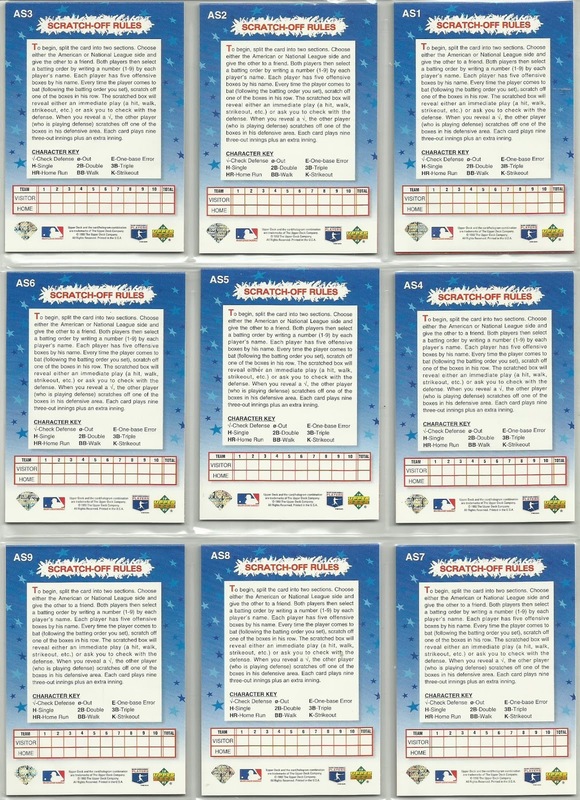 But you get the idea: 12 cards and a scratch-off contest card. Out of 36 scratch-offs pulled from the box, there were only 10 different, meaning I got at least triples of the 10 cards pulled. See? Horrendous. 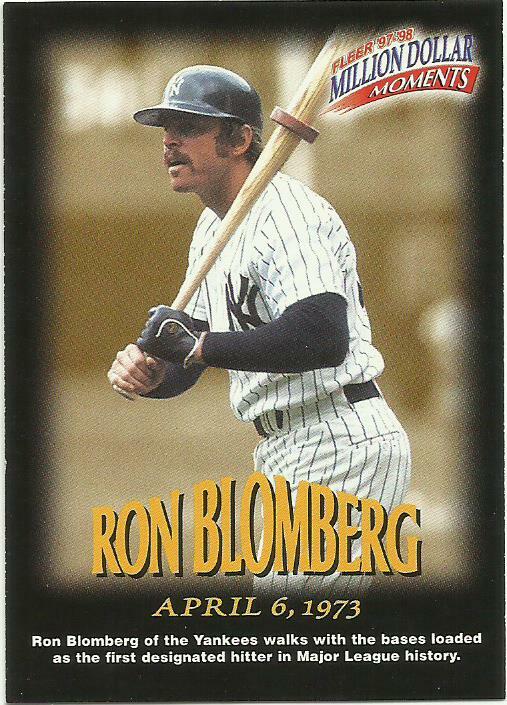 The only insert cards beside the scratch-off, came in a 10-card set of Player Nicknames. I managed to pull 4 different cards from the box. Not bad. I don’t think I’ll be pursuing this sub-set though. All in all, it was a fun break, I managed to pull 202 of the 264-card set. Pretty good. And as always, any help finishing it off will be returned likewise. 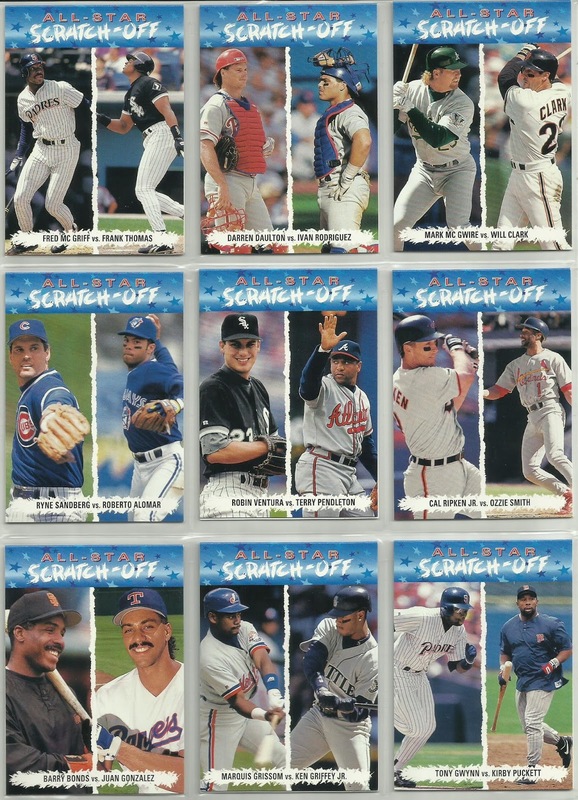 Pulled a full set plus of these scratchers, in a recent rip of a foil box. And for a random insert, that's really good. Sadly, there were no Angels starters in the 1992 All-Star game. And Mark Langston was the only reserve. Nine cards in the set. It's always nice when a set is a multiple of 9. 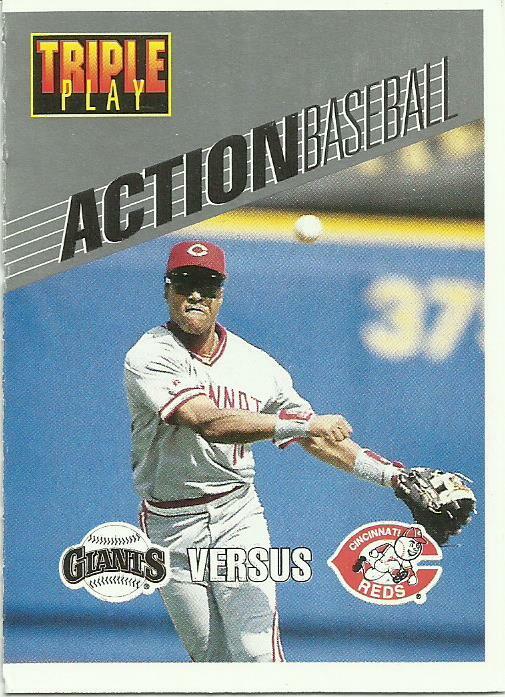 The players on the front were matched up by position. It would be interesting to find out how all the matchups actually played out. 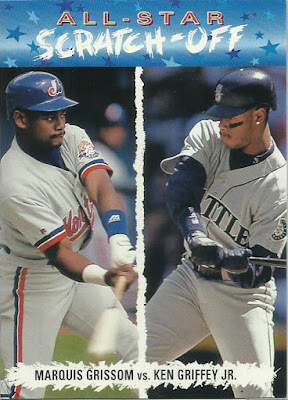 I do know that the AL won 13-6, and Griffey was the MVP. 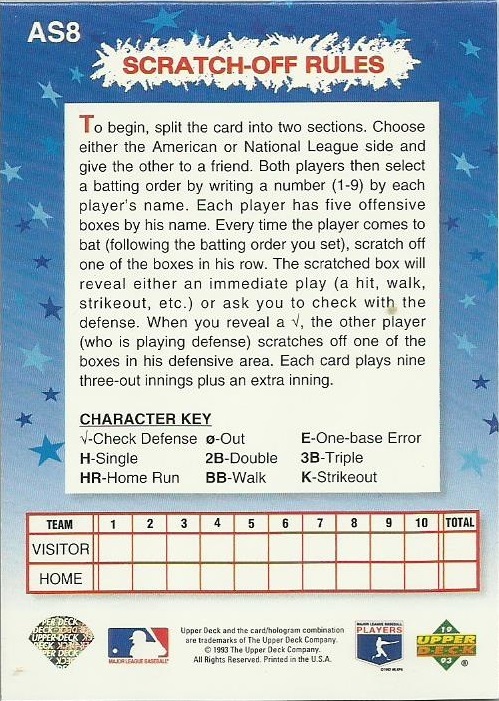 The backs have the game rules, and a place to keep score. I never actually tried to play the game. 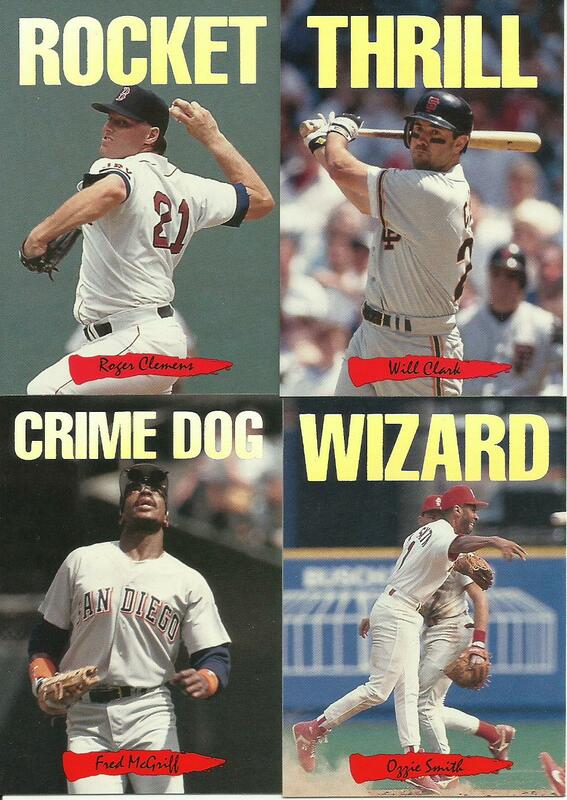 Just reading the names on the AL side it was obvious their team was stacked. 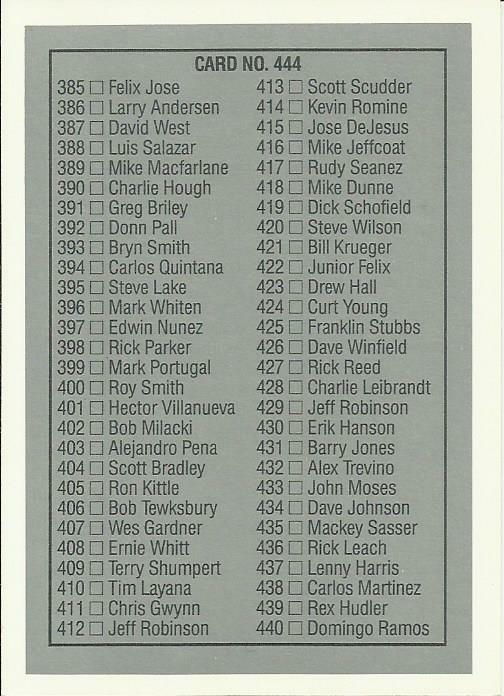 I mean look how many HOFer are there. 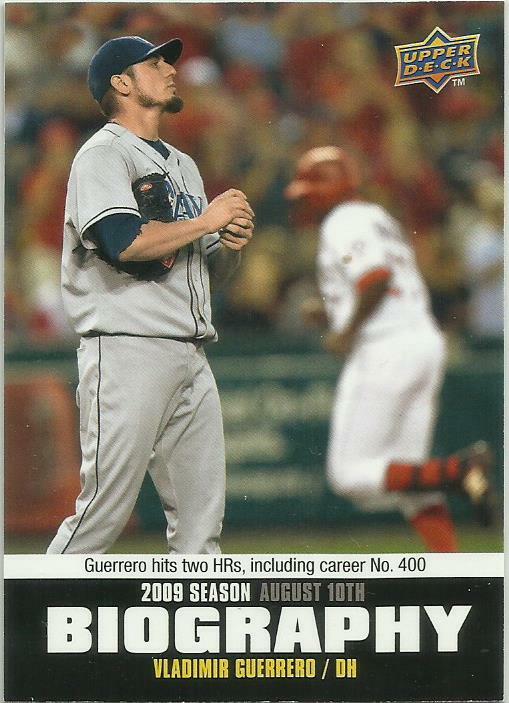 Got a nice envelope from Nachos Grande recently due to the Season of Giving. Chris hit several subsets I'm working on. 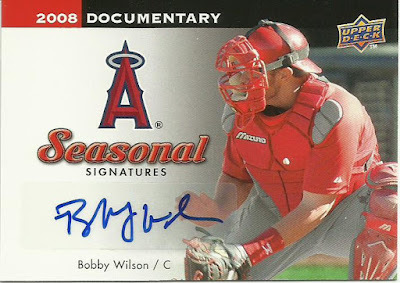 Doesn't take many cards to make an envelope awesome! Bailey played for the Angels in 2016-2017 seasons, and is now a free agent. Returned after 157 days, mailed to the Anaheim Stadium. 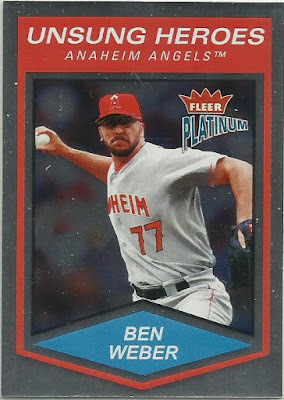 Always fun getting a PWE from Fuji, a fellow Californian. I love getting mail from California, especially since I've been away for so long. 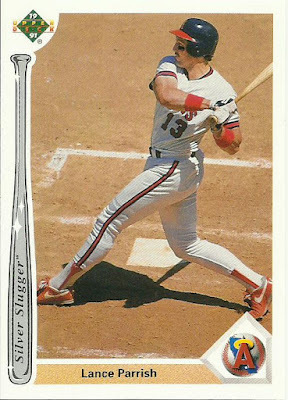 I remember how thrilling it was to pull a Silver Slugger out of a pack of 1991 Upper Deck. 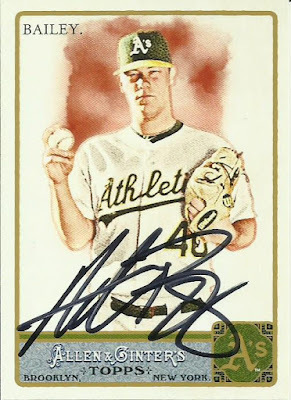 There is a variation of this card out there that I'm looking for as well. 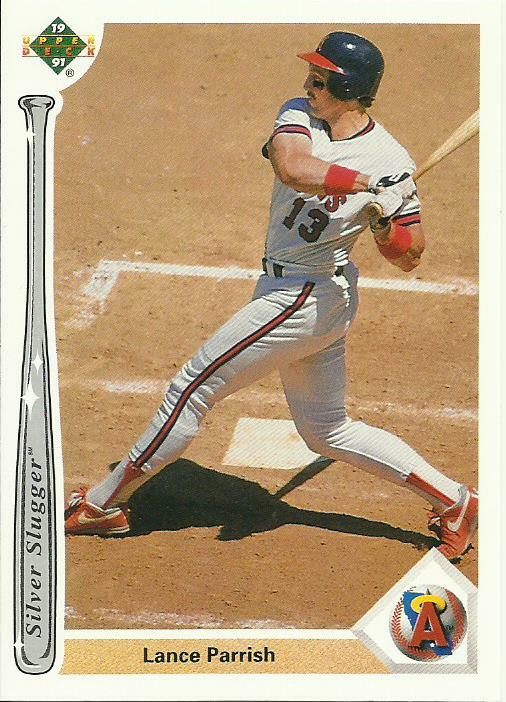 It has the SS11 in italic. 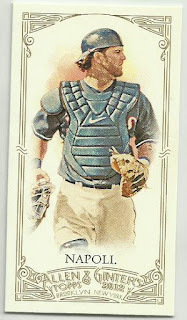 I opened a lot of 2012 Bowman Platinum, in fact I'm still working that set. 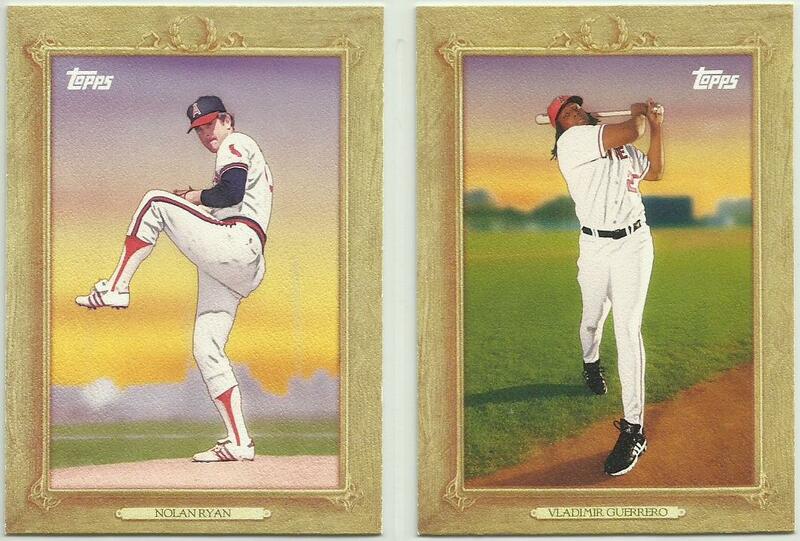 Consequently, I DID NOT open very much 2013, so these color parallels are very appreciated. 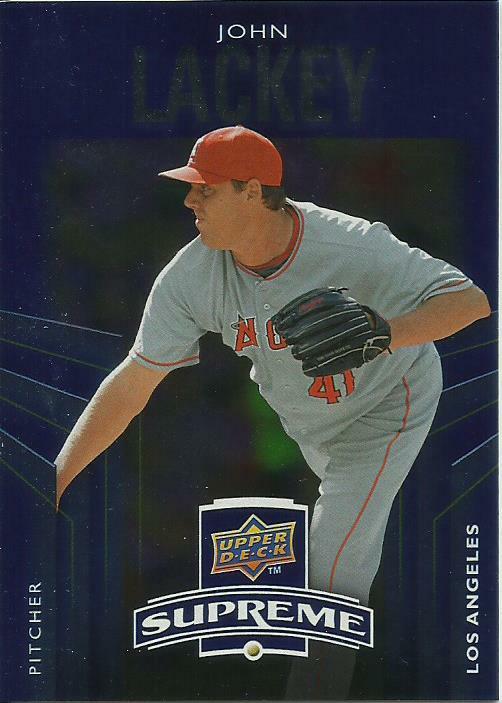 After 15 seasons, and still a decent starter, will Lackey come back for another year? 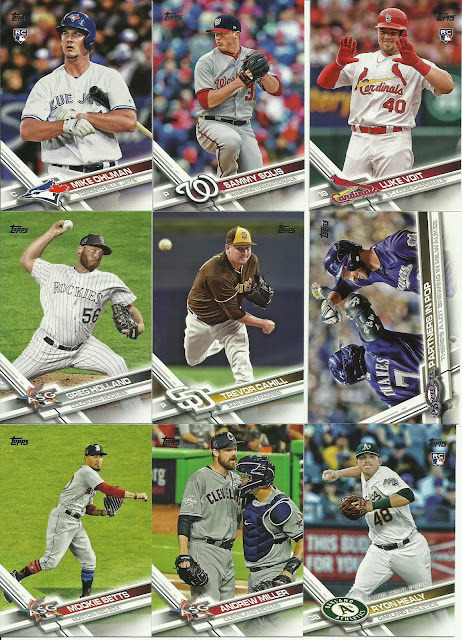 I was so put off with 2010 Upper Deck (you know, all the airbrushed-out team logos and such) that I didn't buy much; therefore my team set is lacking. 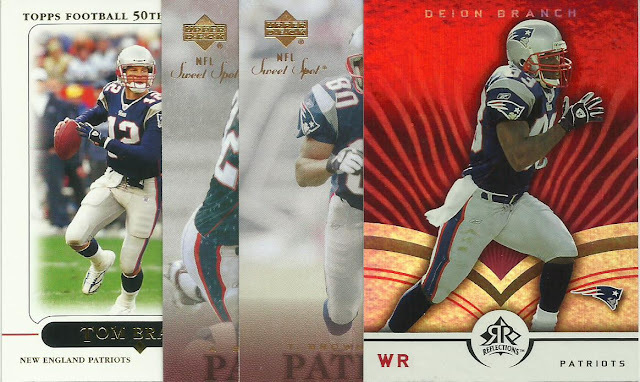 So, again, glad to have these. 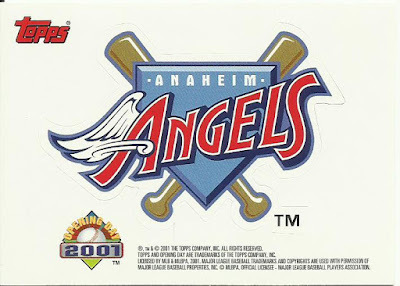 Oh, love my Angels logo stickers, even this Disney inspired one. I always especially appreciate getting Panini Angels stickers in trade packages. It seems not many traders have them available for some reason. It's like pulling an insert out of a wax pack. Ah yes. 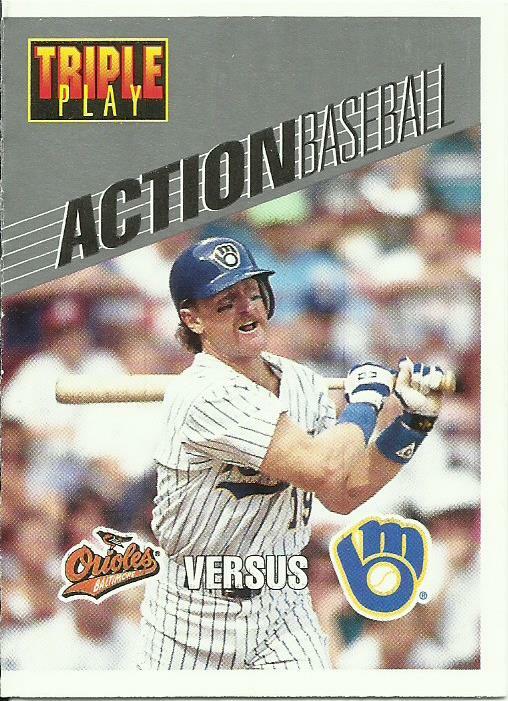 I tore many packs of these a long time ago, enough to get a complete series one in 1990. Didn't save any of it, gave it all away. These holograms are pretty cool for the team collection though. So that was a sampling of what Fuji sent, that wasn't even everything. That guy can cram a lot of goodies into a PWE! I reached out to Colbey to let him know that I pulled a bunch of 2008 Upper Deck Timeline that he needed (I too am trying to finish that set), and he responded happily and offered to send stuff back (I love it when it works that way). So we set the trade up around those, the rest would be Angels "extras". But they turned out to be real good extras. Here's a few I picked out. 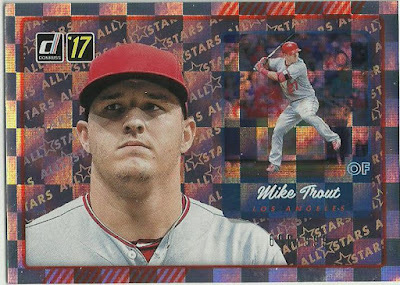 Trout is everywhere now, it's hard to keep up, so I'm very happy to get these inserts. I kinda miss the gaudy eyesore that was Pacific Trading Cards. 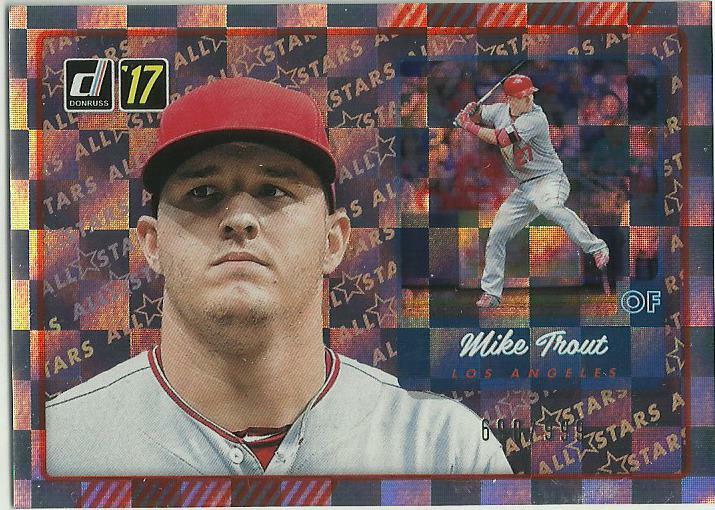 Now this is interesting since I've never seen a miscut framed card. I'm happy with all the cards Colbey, thanks. 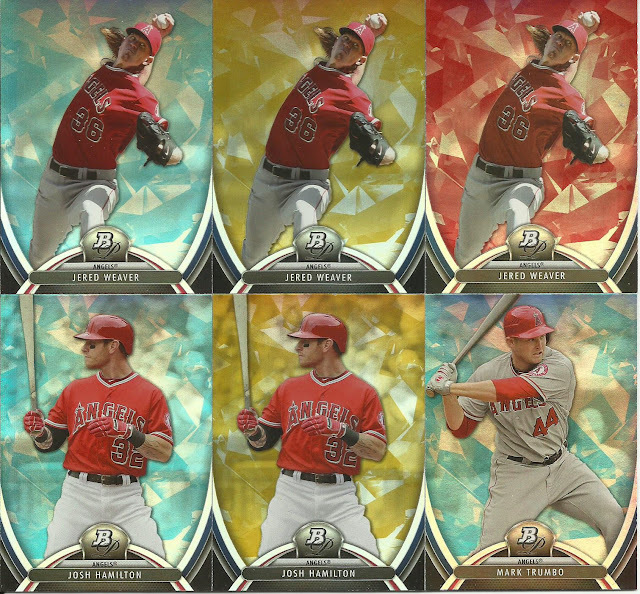 In there are a 100+ cards I needed towards the team set. No dupes in there, so it gives you an idea of how big that 163-card team set is. 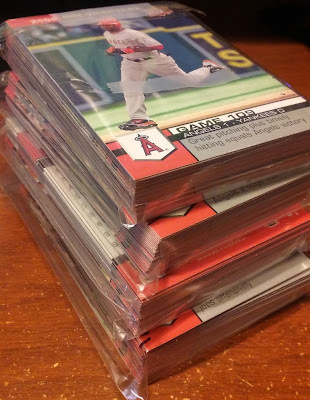 And that's just the base set. Jon also included 17 Gold Parallel versions of the 163 card team set that I needed. See how impossible it is to complete this? I don't even list the gold version on my wantlist, it's so ridiculously out of reach. 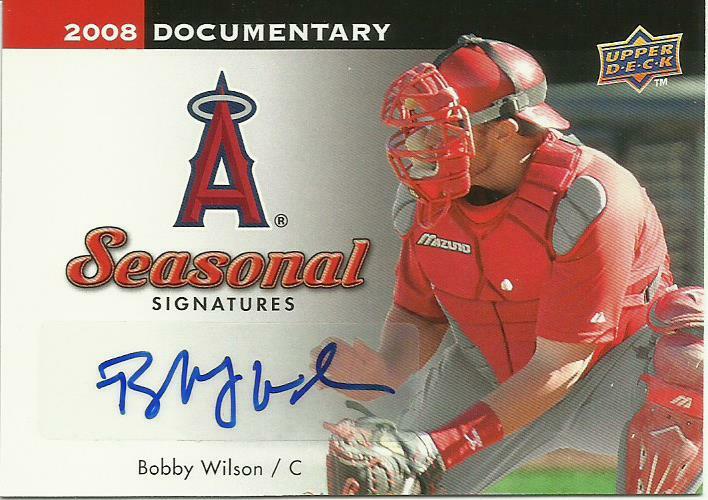 And he included the Bobby Wilson Season Signatures autograph card. Man this was huge Jon. 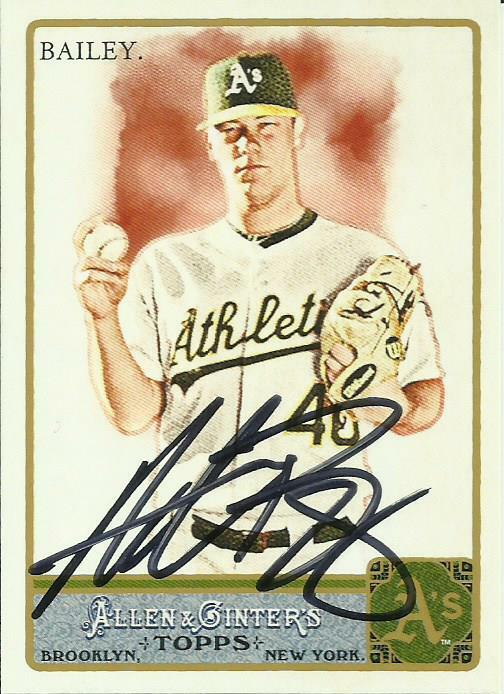 I now only have a manageable 32 cards left to get for the team set. 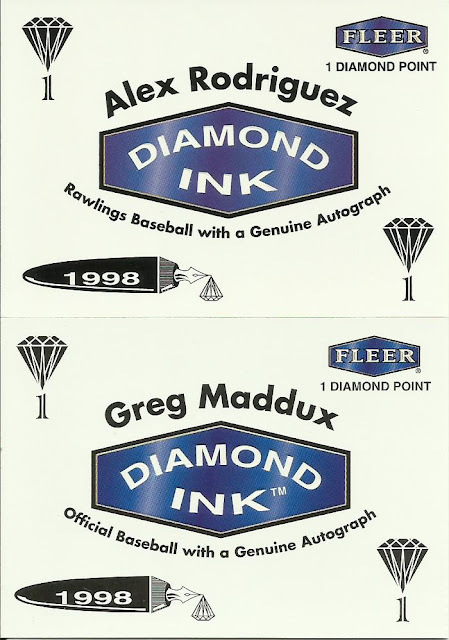 Paul decided he was going to rename his blog from Paul's TTM Autograph Blog to something different so he held a contest. I can't remember who won (the blog seems to be out of commission right now) but actually other participants got a prize as well. I won a mixed lot of Angels, wantlist cards, and a bunch of random fun oddballs. Paul's new blog is titled Scribbled Ink. 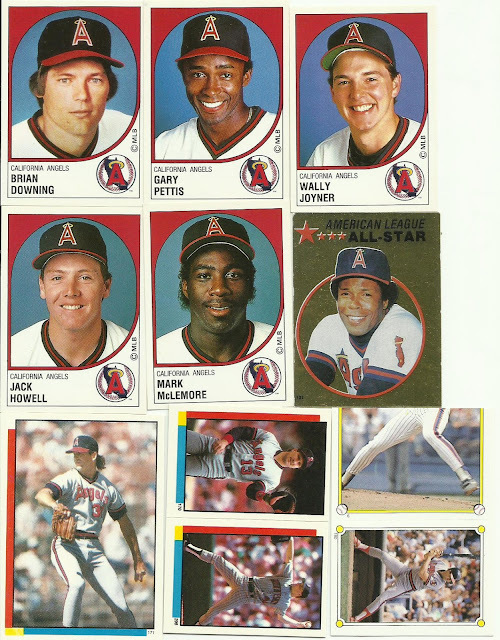 Sampling of the many Angels parallel cards. The Vladdy was in an unopened cello pack that also included a card of Hideki Matsui albeit in a Yankees uniform, not an Angels. 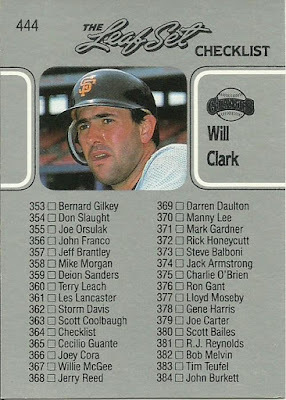 Checklists were included which is always nice filler for the sendee, but very welcomed for my collection. 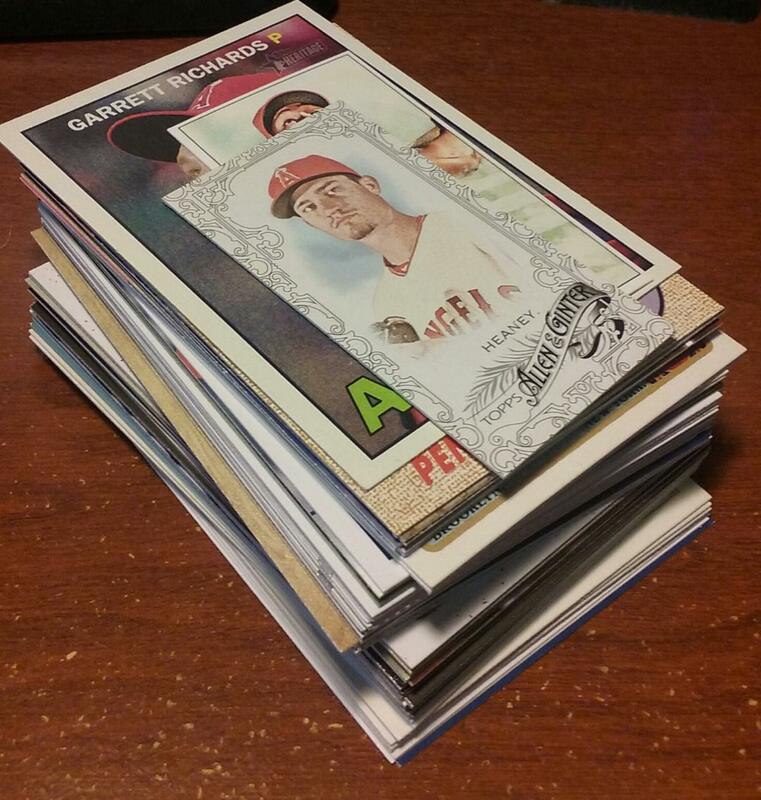 Another sampling of the player collections stack that was included. 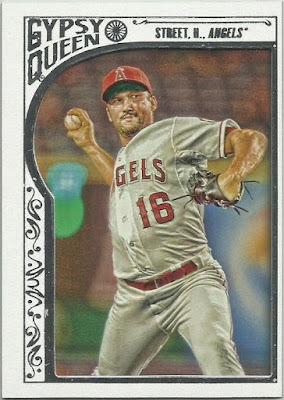 The Todd Greene cards are much appreciated. 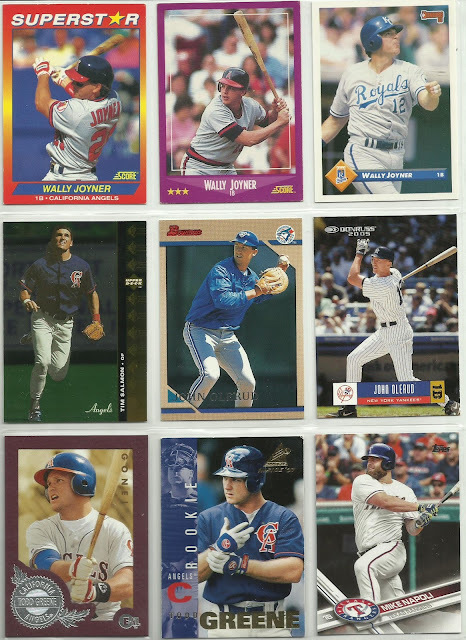 And there was actually 30 John Olerud to beef up my collection. 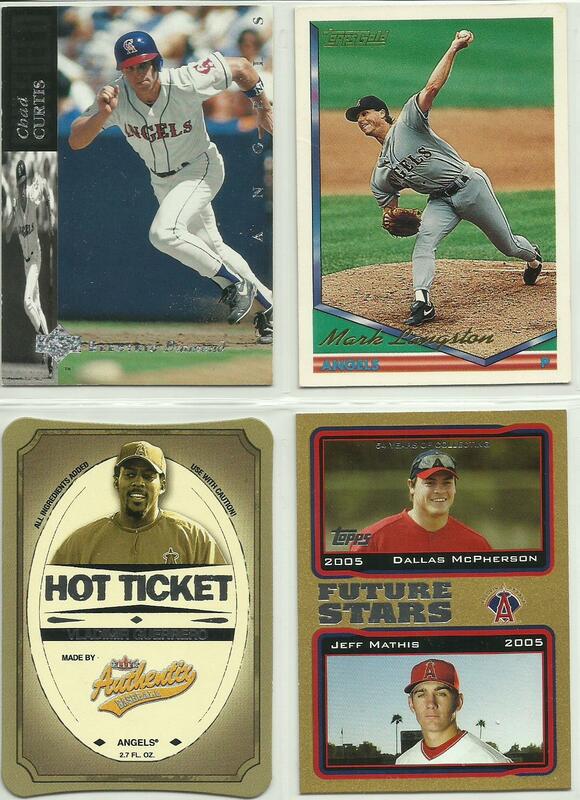 Five unopened packs of 2010 Topps Attax were in the mix. 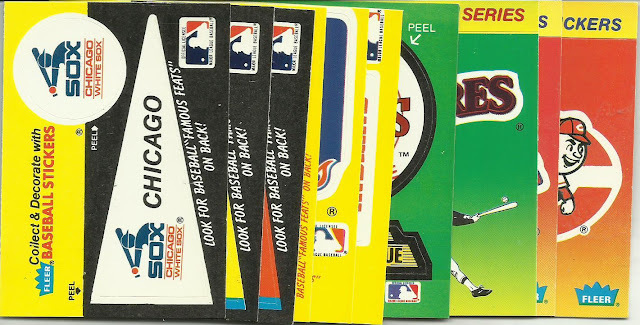 Always fun ripping a pack of anything. 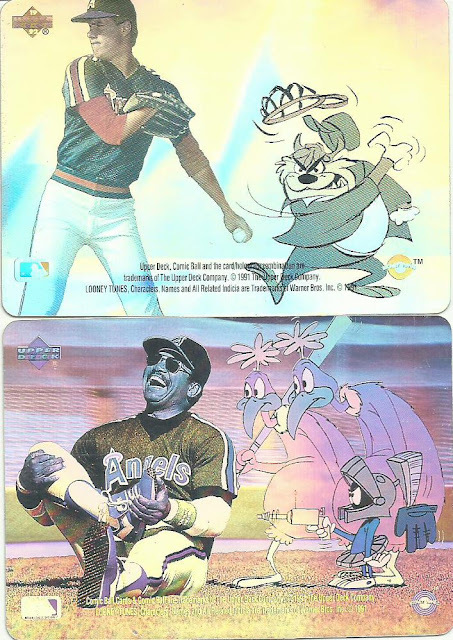 Paul also included an unopened pack of Doodlewonkers, kids trivia and puzzle cards. Never heard of those? Me neither. Be looking for a post on them soon on A Pack To Be Named Later. 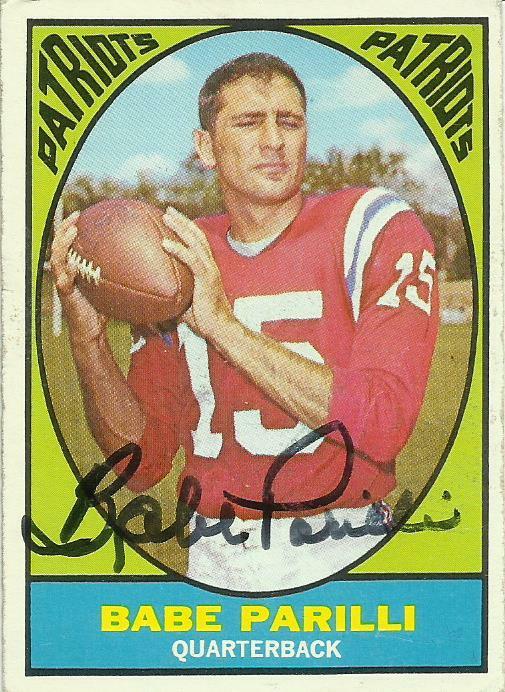 Even a few Patriots cards. Paul really looked at my interests. 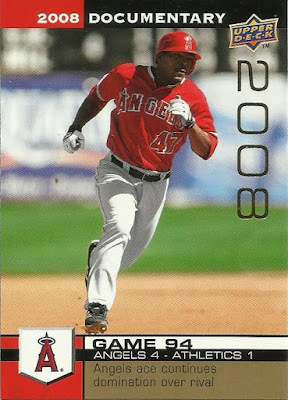 In the winnings I also found a handful of pocket schedules which is great because I can use them to trade for the Angels schedules I've been lacking. 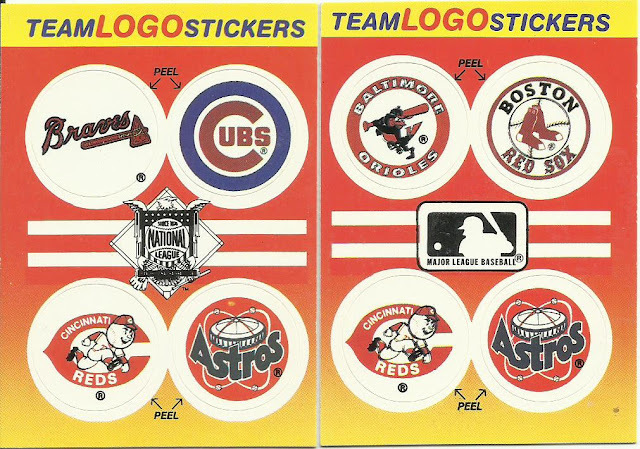 There was also a Red Sox window insignia (that will be passed on) and an unopened pack of Ricky Martin trading cards I just can't bring myself to say any more about. Will Clark gets a mugshot on this card numbered 444 from 1990 Leaf. 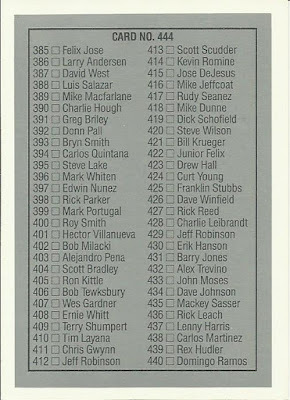 First of 2 consecutive years that Leaf's #444 card was a checklist (1991 had Darryl Strawberry on it). 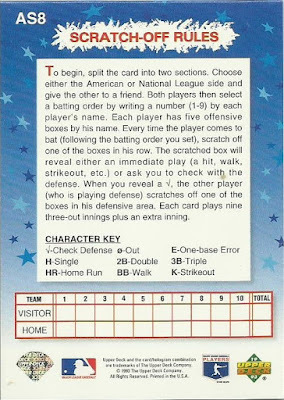 however, we know that the picture side of the card is the front side because of the numbering sequence. 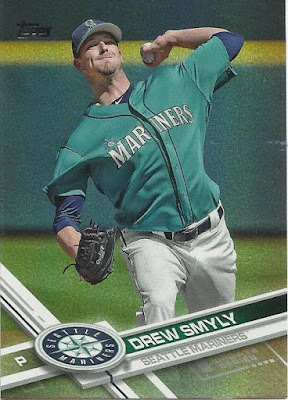 I actually bought two packs of update, one was meh, as I expected it would be, and the other was decent. Below are the contents of the other. 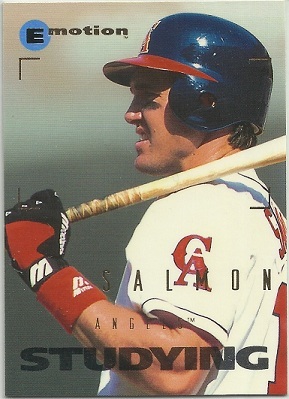 oooh, bad scanner alignment job there on the base cards. I lean towards buying update more than the series 1-2 cards because of the rookie cards. 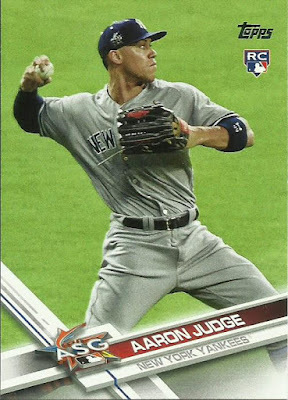 I guess the big one to pull this year would be Aaron Judge right? 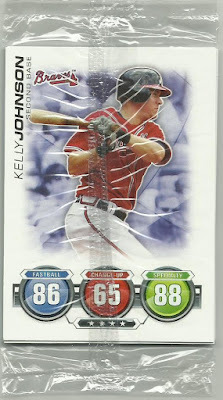 The inserts in this pack were pretty good, at least fact that there WERE inserts in this pack. 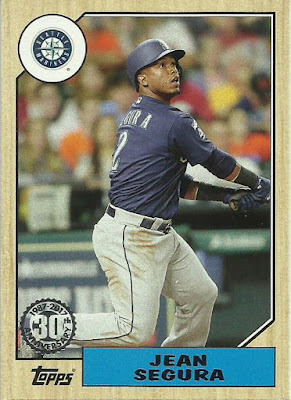 I've begun to rely on pulling at least one insert per pack, I feel Topps owes me that. And there's that Aaron Judge rookie, albeit the All Star Game version. I guess that counts right? 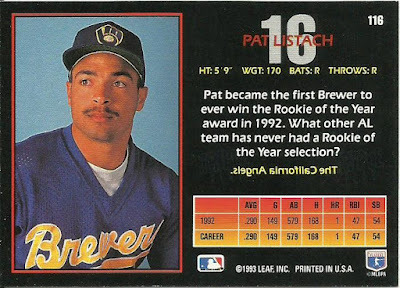 13 cards in a 12 card pack isn't bad. I always judge (no pun intended) a pack by how many Angels I pull out of it. This one rates an F.